Classes were lulling a bit last week in terms of inspirational and delicious recipes. It was also a busy week because I was the assistant, so I didn’t really have time to blog when I was too occupied with stressful thoughts like where to find pear alcohol and chopped almonds in the pantry. We made a caramelized pear tart with a sweet pastry on a sweltering hot day, and it was so warm in the kitchen that the chef told us to roll out our dough completely between two sheets of parchment. He was a new chef to the school, and I laughed inside about what the other chefs would say/do if I whipped out two sheets of parchment for rolling dough during the final exam. The tart consisted of too many things going on at once that I didn’t enjoy it very much. 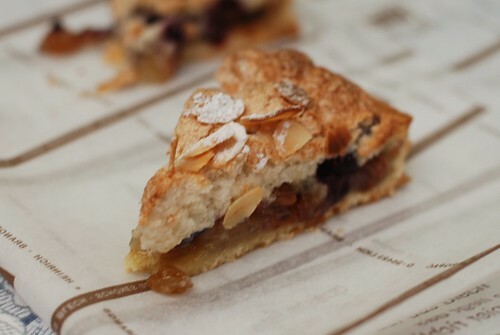 It is a nice sweet pastry filled with cooked canned pears dotted with raisins and canned black currants. 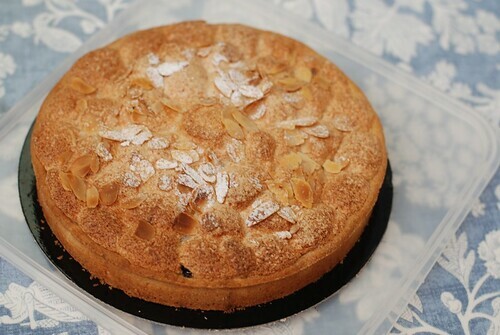 Then we made a dacquoise-esque egg white and almond mixture to pipe on top so it had a cake-like crust on top, and then sprinkled with almonds and icing sugar. I think it’s a tart with an identity crisis – is it a cake? a tart? a fruit thing? Plus, raisins are definitely on my list of offensive foods. I can only take them occasionally in an oatmeal raisin cookie, all other forms are denied. So this tart really had no chance, poor thing. During the practical, the new chef who speaks only French was very abusive with my name – he would call me for the most random things, and the way he called my name made me really jumpy. Take, for example, him showing up next to me when my dough was flash-freezing. I was measuring out dry ingredients for the next step. He came by, said in French three times because I couldn’t understand him right away, that I shouldn’t be doing this because my dough wasn’t moulded into the tart ring yet. By the third time, I was getting pretty nervous – what the hell could I possibly be doing wrong that he needed to emphasize something so many times? When it finally dawned on me, he had moved on, I had lost a few brain cells, but was a little indignant that I didn’t get a chance to reply. So then I had to keep an eye out for him to come back around to me, so I could rebut, a few minutes too late, that I had nothing else to do…so the logical thing was to prepare the ingredients for my next step even though I wasn’t quite there yet. It was exhausting, this constant back-and-forth, and needing to stand up for self because he wasn’t quite on board with me but knew I understood just enough French so he could continue to stalk me. At one point, thank goodness I was quick enough, the chef called out my name urgently as I went to the sink to drop off my whisk. I ran back to him, thinking oh no, my egg whites weren’t done, I misunderstood him! He held up my pear-stirring spatula and asked why I didn’t take it along to wash. I was quick enough to point to the myriad of clean slotted spoons next to me to say that’s what I use to fold my egg whites. I didn’t have the language skills to say, can you please not be so concerned about my spoon, but hey how about let’s talk about my technique here? In all fairness, the chef was a nice man, and definitely friendlier than some of the other chefs. However, his obsession with me that day made it really hard for me to concentrate and feel confident about what I was doing. That, combined with the fact that I wasn’t even looking forward to the end product, made for a really trying practical class. I couldn’t wait to be done, and had a drink at the bar by the school before I came home because it really was that kind of a day. 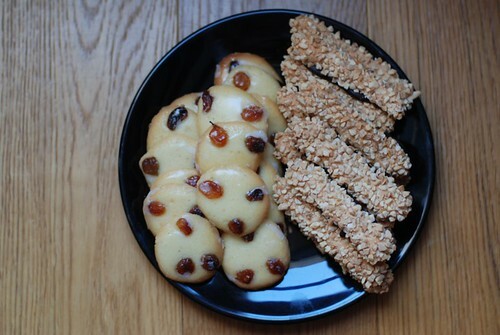 Moving on to the “marshalls’ batons” and raisin cookies…it was a bit of a weird class. It was a class meant for “dry petit fours”, but it is really randomly placed in the curriculum as it has nothing in common with what we’ve been doing (a lot of tarts and cakes if you haven’t noticed). We got to practice whisking egg whites again, but basically I think this class is kind of known as a “write-off” class to many people at the school. The demonstration for this class was fun, though. On top of the batons and cookies, we saw the rolled cigarette-like cookies, and macarons made by the chef. The macaron technique was carefully explained, since we had the young chef who goes through a lot of detail. The class went into overtime, but we all enjoyed the lesson so much that it didn’t even feel like a really long class. For the practical, we had a chef who I think is part-time at the school. He is the epitome of “Don’t judge a book by its cover”. He was friendly, helpful, and super calm during the class. He didn’t hurry us, he stopped by and pointed out where things weren’t good, he encouraged, and he even helped me put things away to alleviate the assistant duties. He wasn’t too jolly that he was joking with us, but he was easy to work with. Ha, not so much at the end. When he marked the class, he gave everyone 3’s (out of 5) and I think there was one person who got 3.5, maybe two. He wasn’t hiding the grading sheet, so I kept craning my neck to read it. I was so surprised that the grading was so harsh for someone who didn’t criticize too much and was generally calm and in a good mood. I think the French girl in my class was really outraged, because she stayed after class and asked the chef about the marks, and received a very, very long lecture instead. I stuck around to listen to part of it, but zoned out and made my escape when the lecture went over 5 minutes and my eyes started glazing over. The cookies were good little snacks – I ate the batons sprinkled with almonds and dipped in tempered chocolate, and Alex devoured the raisin cookies. 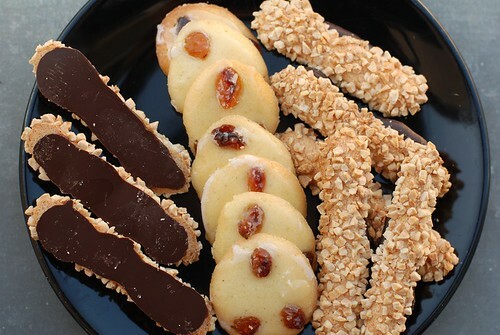 The batons were baked to be crunchy on the outside and chewy meringue-like on the inside, and since it’s doused with nuts and chocolate, it tastes primarily of the dressings rather than the cookie itself. The cookies are not my favourite type of cookie dough feel – they’re soft and cakey, especially since they didn’t spread very much on the parchment. However, they are still sugary and dipped in glaze, so Alex gladly ate them all anyway. From here, it’s onwards and upwards, as we venture into more exciting recipes! We’re making little orange and chocolate tartlets next – the best flavours for tarts, in my opinion. Then we’ll be off to the land of croissants and brioches – yum! I love reading this blog. It makes me so happy. And ditto on the rasins. The only other place I like raisins, (other than oatmeal raisin cookies, and even then I waaaaay prefer chocolate chips instead) is in an apple turnover. Ok, am SUPER excited about your croissant and brioche phase. I’ve been meaning to ask you if you’re going to be making pain au chocolat any time soon. Promise to teach me how to make it when you learn? 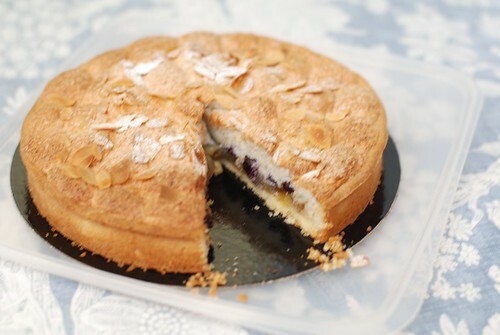 Its the one french pastry I’d really love to know how to make. It’ll be a class on pain au chocolat and croissants, then a class on brioches. I’m excited!